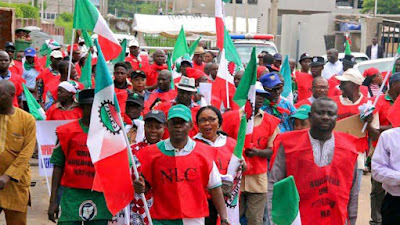 The Nigeria Labour Congress (NLC) has directed workers to embark on a nationwide warning strike from Thursday. The strike is to press home the demand for a new minimum wage after talks with the federal government’s tripartite committee stalled. The government was recently issued a 14-day ultimatum over the matter. Peter Ozo-Eson, general secretary of NLC, issued a directive on the warning strike in a statement on Tuesday. Labour directed all industrial unions in the country and state councils to begin the mobilisation of their members ahead of the strike. The statement read: “This is to inform you that the organised labour shall commence a nationwide warning strike in respect of the non-implementation of the National Minimum Wage effective midnight of Wednesday, September 26, 2018. Similarly, the Trade Union Congress (TUC) also said the strike will proceed as scheduled following the expiration of the ultimatum. Musa-Lawal Ozigi, TUC secretary-general, said the decision to embark on strike was sequel to the resolution of the central working committee (CWC) of TUC. “Strike is hereby declared to commence from early hours of Thursday, Sept. 27, 2018,” Ozigi said.